The following are the stories of just a few of the youth that have been a part of our program in the last few years. Each of our youth has their own unique story to share and their own adversities to overcome. 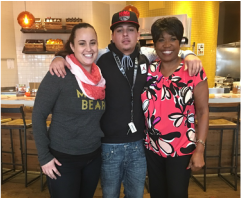 Youth Update: Chris passed his GED Test in October 2016. Congratulations, Christopher! ​Christopher joined the OSY program in December 2015. Christopher wanted help finding a job. He had never worked before and needed our help becoming employable. Christopher successfully attended all the workshops, participated in community service events, service learning, and leadership activities. Christopher finally interviewed for his work experience with Syntrol Solar in Roseville, CA. After completing his 250 hours he was hired as a full time employee and after a couple of months was able to purchase his first car. Chris with the Out of School Youth Program Coordinator and Case Manager, celebrating his GED! Ryan came to our program at 18 years old. Ryan was having employment difficulty with no work experience, was low income, and living in a high poverty neighborhood. Ryan quickly showed us his consistency and hard work. Ryan struggled with communication skills and soft skills. Through engagement in workshop he was able to gain confidence and self esteem. He was placed on a work experience through OSY at Winsol Groundworks. During his 250 hours, he proved to the employer that he was a great asset to their company. He began preforming IT tasks, fixing computers, running the company website. ​At the end of his work experience he was offered a full time permanent position with the company doing their IT work. To date he has developed a QR code program for the company that allows them to check out work vehicles and track them daily. He has also obtained his driver's license and now has his own car to ensure his transportation to work.